It seemed while still far from being 100% - both Don and I did feel a bit better this morning – although the thought of eating and drinking still made both of us feel nauseous, so not much breakfast was kept down. We decided to give it a go on the bike and see how we felt. I knew there was still a fair bit of climbing ahead of us even though the distance wasn't great after we had driven further at the end of yesterday. Deep in my heart, I would have to think it would be a miracle if we had recovered enough with half a day's rest - but nonetheless - we would find out! I have to say it felt great out on the bike initially and we meandered through a beautiful spot named Peeples Valley. Such a contrast to the stark, barren, hot land we had been in for the previous 3 days. This had good pasture, plenty of irrigation happening, and we actually saw beef stock and lots of horses. The name "Maughan Ranch" seemed to appear prolifically in the area. They must have a huge land holding in the area – oh have just googled – they have 512,000 acres!!! Several of the “ranches” appeared to have different names – but all under the Maughan Ranch umbrella. We rode along great lengths of road with painted rails - and in fact there were a couple of guys painting a section roadside. I reckon they could be pretty much on that job all year round!! This really is a stunning part of Arizona, and the lightly undulating ride was most enjoyable. We reached Kirkland Junction. 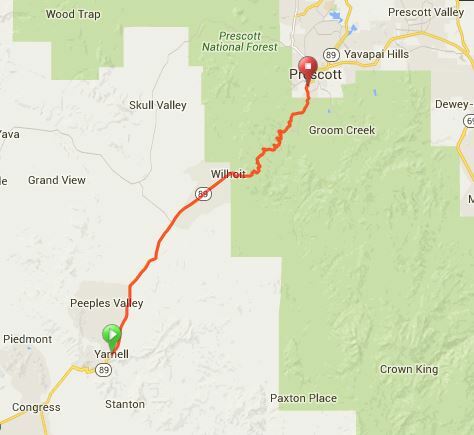 The lady at the Yarnell Motel had suggested we take the longer but less steep road to Prescott. We stopped and thought about it – but we had been given good advice from Mark Shelley who was to be our warmshowers host when we got to Prescott. He had ridden this route and he hadn't mentioned riding anything but the main road so I decided against advice from a non-cyclist and took Mark's, by continuing on HIghway 89. We took quite a long rest at this corner, and utilised a big irrigation system in operation, waiting to get sprinkled with cool water every time it did a circuit and came over the fence in our direction. We must have looked kind of crazy, walking/jogging around under the sprinkling water as it fell. We were flagging a bit, our energy levels were pretty poor, and it was still very hot – but we could see buildings away in the distance and thought we would see if we could ride to there. This happened to be the “village” – (actually all we found was a store and a post office in that store) – of Wilhoit. The road appeared to be flat, but in actual fact we were climbing again - these types of climbs so often trick me. I thought I must have had a puncture and stopped to check - but in so doing, I looked back and saw just how much we had climbed from the junction and realised while biking had seemed a struggle. It took quite a while to get to Wilhoit and we stopped at the "store and Post Office" to take on food and cold water. Again, my energy levels were exhausted, and I don't think Don was feeling much better. From here – another 10 mile climb started. It was now mid-morning and the heat was rising – so for the second day in a row, we pulled the plug with about two-thirds of the planned day ridden. While we sat outside the shop in the shade, quite a few locals came and went, with many to stop and chat for a while. Our van is always a good conversation piece!! When recounting what we were doing, and how we were feeling with the heat and stress, one of the locals offered - "You guys get in that van - don't die in Arizona" he drawled. His words hit a chord though - we certainly wanted to ride all the way - but in these circumstances, that were beyond our control - we had to make sensible decisions!! I got that we had ridden just short of 30 kms today - so were in the car for the final 24. In the car – the climb seemed to go on forever, and it was extremely winding, just as the map above suggests. I know I would never have made it. Despite feeling very low morally, arriving in Prescott was a true delight. It is a beautiful, attractive town, with a lovely park around the Courthouse in the middle of the town. The irrigated green grass around it was something we hadn’t seen for a long time!! We made contact with our warmshowers hosts Mark and Carolyn Shelley and after having lunch in town it was wonderful to reach their home – have a "warm shower" – and enjoy great conversation about the area. I must thank Mark very much for boosting us up, when we were feeling a little battered and bruised after having 2 shortened days on the bike. Mark has considerable experience in cycle touring – and his wife Carolyn has also performed Pat’s role from time to time so understands what patience that requires!! We talked and talked over various biking adventures, and we started to realise that as well as the "heat-stroke" type symptoms we had been feeling we had now risen considerably in altitude - so this could have been adding to the lethargy we were feeling. Fortunately with that altitude the weather had cooled too which I think helped as we had certainly had enough of the piercing heat the previous few days. With the punctures we had been getting on Mark's advice we went to his local bike shop "High Gear Bike Shop" to get more "toobs" and tyres. Thanks for the drinks bottles guys - and the discount on the goods we purchased! Carolyn cooked us a beautiful meal, that we enjoyed eating out on their deck amongst the local bird and wild-life. We learned a lot about life in Prescott, and a lot about Mark's touring experiences - and I know I went to bed feeling a whole lot better about things! While still not feeling energetic, I had been able to enjoy (and keep down) my first meal in days! A certain sign I was on the improve!! Mark was also going to ride out about 40 kms with us in the morning - and his explanations on our health issues had been re-assuring and helpful. I had looked at the profile for the day and it looked good going for the first 85 kms before we had some serious hills to get to Williams. This was where we had our first "rest day" planned for - so I was hoping we could manage a good part of the ride, enjoy a rest and get back on track.